The months events includes walks, cheering, waving flags, and wearing t-shirts with cute catch phases like “Save the Tatas”. And let’s not forget the infamous pink ribbon that is worn to show support for those diagnosed with breast cancer. I know the ribbon has been worn for me and my family, a gesture in which we greatly appreciate. However, for me, breast cancer was not a pretty pink ribbon that’s sometimes bejeweled in rhinestones. That post was written back in April. I actually wrote the words one year after my breast cancer diagnosis and I still have the same sentiments for the whole Pink Ribbon Campaigning that I had before if not worst. Since then I have continued to advocate that it’s not about the cure but the cause of this disease. The disease cancer is being used to make multi-million dollar companies even more money. If you have not seen the movie Pink Ribbon Inc., I implore you to watch the trailer below and either purchase the film from Amazon or watch it on Netflix. This is (partially) why I no longer race, run, walk, skip, hop, jump, roll, scroll, flip, dip and any other creative form of transportation for the cure!!! For those who have contributed to these organizations you have done a great service because your heart was/is pure in giving. I would only ask that you research the organizations you chose to donate money to in an effort to make sure that every dollar counts. I ranted in the aforementioned post about the billions of dollars raised yet we are not closer to finding a “cure” than we were when the war on cancer was initiated in 1971 by President Richard Nixon. Here are some facts from the research done by physicians. They have found that chemotherapy has very little impact on the “curative” or life sustainment for the patients who receive it as part of their treatment regiment. The conclusion to the overall research found that chemotherapy has an effective rate of 2.1% towards the 5 year survival rate. And by the way, the 5 year survival rate is just a tactic to make the numbers appear better than what they really are; who do you know that only wants to live an additional 5 years? Furthermore, the cure for cancer already exists. It just can not be patented for profit because it exists naturally. So why do the pharmaceutical companies need more and more money each year for research? We give/raise money and purchase pink products where the companies donate a small portion of the proceeds to non profits year after year for large companies like The Komen Foundation, Race for the Cure, 3M (pink post-it notes), KFC (pink buckets), Black and Decker (pink tools), and so on to do what? : (drumroll please) MORE RESEARCH. What the heck are they researching and creating? I will tell, more drugs in which funding comes from you in order to patent a drug to sell back to you to make them even more money if you or your loved one is diagnosed with cancer!! At this rate and profitability there is no reason to find a cure. They can simply continue to INEFFECTIVELY treat the symptoms of cancer using toxic drugs. (Things that make you go hmmmmmm). 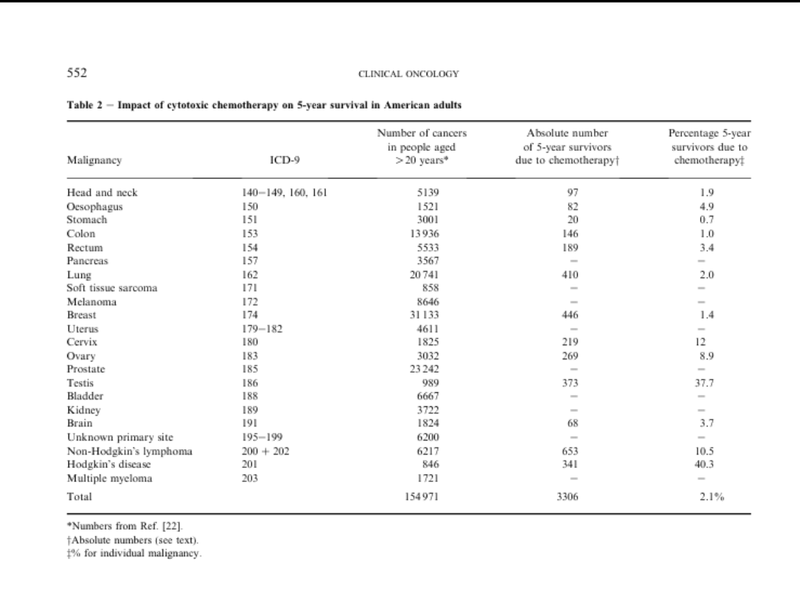 See the chart below for chemotherapy’s effectiveness for each cancer listed. Click here to read the full report on Chemotherapy 5 year Survival Rate. You have to ask why are doctors and scientist not paying attention to their own research written in medical journals for all to see and learn from. This was a 14 year study that was eventually published in the Journal of Clinical Oncology in 2004. I am not a doctor or scientist and therefore would advise any and all to consult with your physician but I can read, research information, and share the information with you to be sure your physician is providing you with the most up to date information available. I hope you will dig deeper for yourself or a loved one if facing cancer. You are your number one advocate. Therefore find a physician who will be honest and up front with you about the side effects AND the effectiveness of treatment. This was all I would have appreciated from the beginning but was not aware. Morgan, G., Ward, R., Barton, M. (2004). The Contribution of Cytotoxic Chemotherapy to 5-year Survival in Adult Malignancies. Journal of Clinical Oncology, 16: 549-560. doi: 10.1016/j.clon.2004.06.007.